Emily I love those scrappy fish, they are the cutest I Spy Quilt ever!! I am very little help with the layout of the quilt, they both look good! Hi Emily! Visiting from the New Quilters hop, and what a surprise to see Tango!! I like layout A, as the secondary design will show when it is sewn together better. Love your blue background! 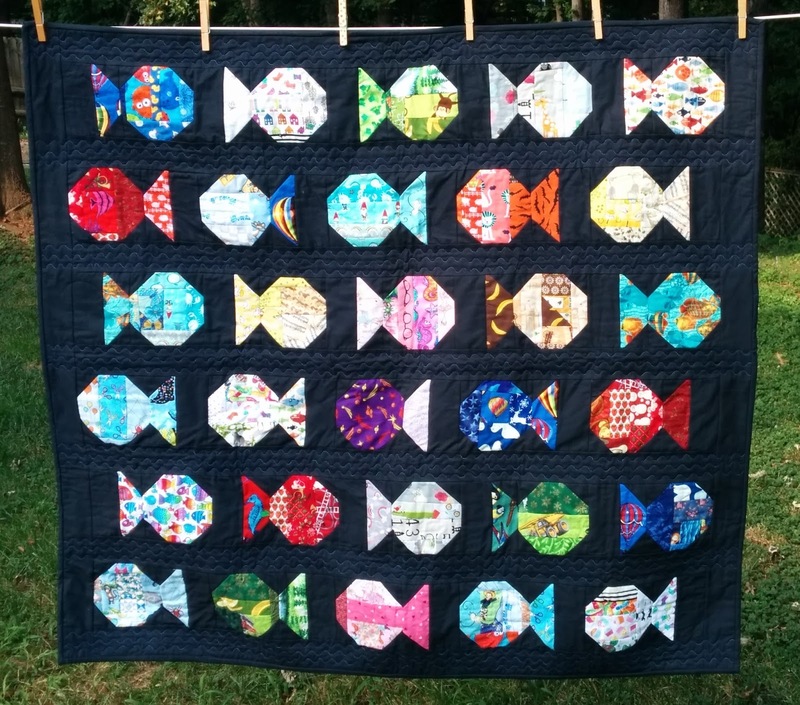 Love your colorful butterfly quilt and the fish-simply adorable!! The dogwoods are blooming here in Oklahoma, USA as well. I love this time of year! Your quilts are lovely! I like the bright colors. Good luck on the New Quilters Blogger. I immediately liked layout B better and then went back to compare to layout A and then I couldn't make up my mind. I read the other comments above. I didn't see the secondary layouts very well in either - probably since I didn't sleep last night. I don't know what and something about layout B caught my attention at first. I love the I SPY quilt. I've wanted to make one for a long time and just never have. If I'm going to do it, I certainly need to do it as I think what will probably be my last grandchild will be four in July. I love the collage of animals. I don't tend to make quilts from scraps. The quilts I have made thus far have been from kits and there is not much excess fabric from them. I also buy enough yardage so that I hate to cut into it because it because it could be utilized for a large quilt. I need to just bite the bullet and do it. I really like the saying, "Finished is better than perfect!" But I do have perfectionist tendencies that get in my way a lot of the time! Dogwoods are super popular in our area too (SW Missouri). One of the local quilt shops is even called Dogwood Quilting. Great to meet you! Lovely to learn more about you in this post and I love the fish quilt. I think that I like the second layout better because there is so much going on in those lovely scrappy blocks that the same orientation gives just a bit of order. But I do love the other one too. Glad to see you in the blog hop! 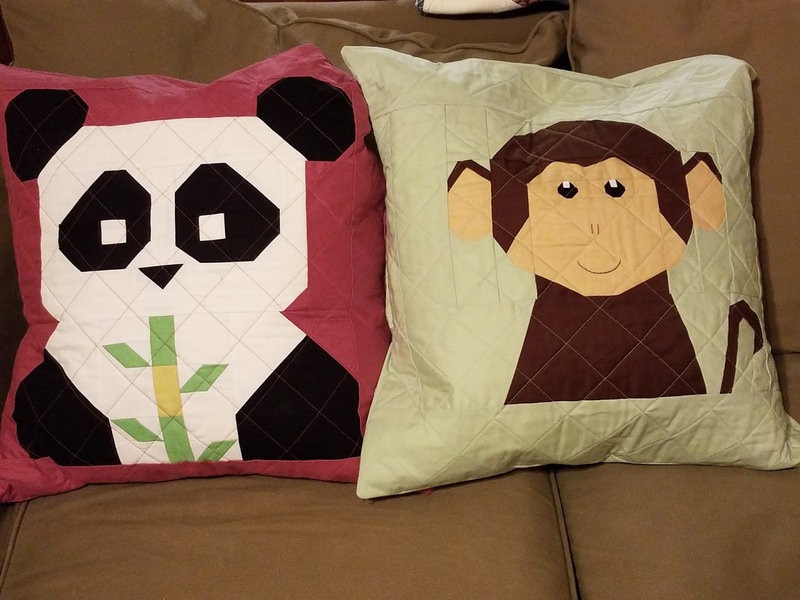 I love the monkey pillow! 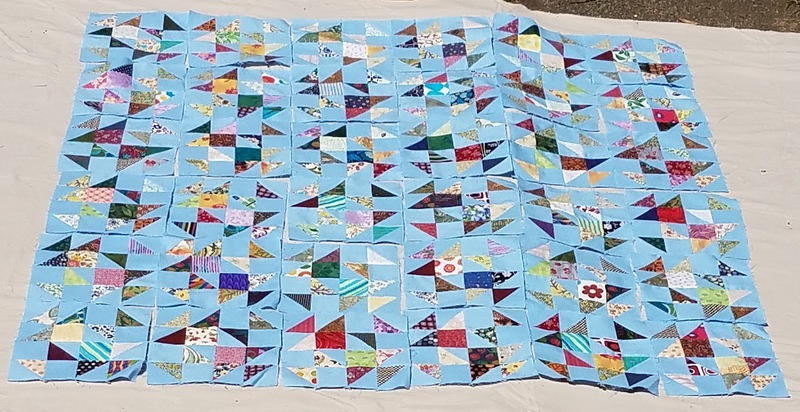 I'm also happy to see that someone else is still working on Scrap Dance Tango - I've had my blocks finished since last summer and I'm hoping to get the top sewn together this month. I think I like B better. I definitely love the blue fabric of the scrap dance tango. I will vote for layout B. Welcome to the Blog Hop, my day is later on, 1st week of May. My sister lives near Charlotte (Waxhaw) and I was just there over the weekend. It is beautiful. Your quilts are lovely and that is kind of you to donate quilts to Project Linus. Great post Emily. I love your new scrap dance tango, I think B is my favourite. Scrap quilts are where you shine I think, the fish quilt is beautiful as is the bright butterflies. You really have a great understanding of colour and shade. Have a great hop. Lovely to see so many quilts in your post Emily - your menagerie is certainly growing! It's been fun being part of the NQB again hasn't it? I am enjoying having a bit more time this year and have enjoyed the Blog Hop today. I like some symmetry to mine however Layout A is preferred by me. So fun to meet you and see your quilts. I don't do I Spy quilts (yet), so it's fun to see them. As to your Scrap Tango, I think I like A better. It will be fun to see the finish! I'm enjoying the blog posts today! Hi Emily, I'm visiting from the Better Bloggers Hive--it's great to meet a fellow scrap quilter, I say the more fabric the merrier. 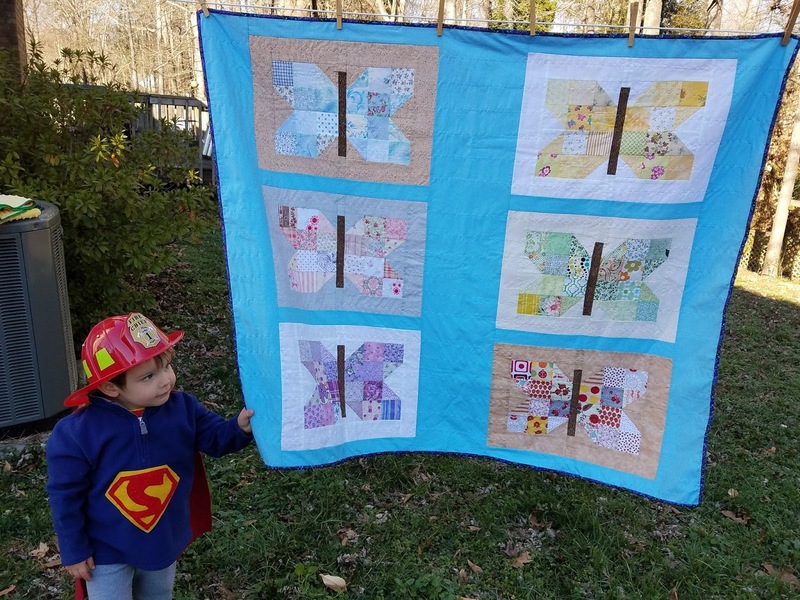 I like both of the layouts and have find myself in this quilter's quandary before. I plan then when I'm ready to finish, I change the plan. I can't wait to see what you decide. I sure do love the Butterfly Quilt. Emily, the fishy eye spy is so cute and so is your superhero helper! Love seeing the butteryflies finished! I think I like layout B! Great post! Both quilts layouts look good but I'm also favouring A. I love your butterflies they are so beautiful. Emily, It's been a pleasure discovering your Blog during Week1. I'll be stopping back by often. Love your blog! I have a similar story to yours in that my hubby broke up with me after six weeks of dating (and I was sure he was the one). I was only 19 so I went ahead and started dating other people. He apparently didn't like that, so he started asking me out again...the rest is history. You do make some fantastic quilts. I love all the cute animals. I love scrap quilts. It makes me so happy to see fabric from previous quilts popping up in new quilts. Having said that, there are times when it makes me happy to buy pretty new fabric and make a quilt out of it, usually for a friend for whom that fabric seems "just perfect". I wish I could let go and not worry about everything being perfect. Some days I can, some days not. 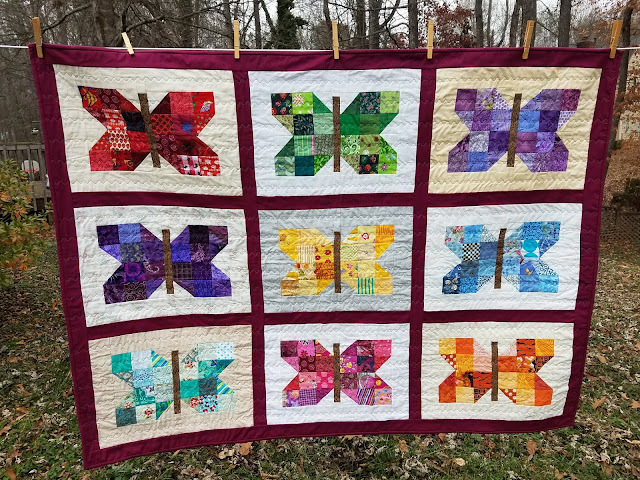 LOL I love the butterfly quilts - those blocks are so pretty. And I bet your son loves all those animal pillows! I think it's funny that you don't consider yourself a perfectionist, but you still take the time to cut your scraps into uniform sizes! I'm a stickler for perfect corners, but all of my scraps get mixed into one big box. Those butterfly blocks are very pretty! For the Scrap Dance Tango layout, I prefer A. I think the colors of the scraps show better against the blue background! The butterfly quilt is my favorite. Just love it. I like layout b and I love working with scrap, all the way down to the 1 inch pieces. Fabric is to expensive to waste. I had to look a few times, but I think my eyes are really drawn to layout B. I love scrappy quilts, but I've only made a few of them. It was fun to read about you, your quilting and your family. I am more a traditional quilter. I like the saying "Finished is better then perfect". The more you do, perfection will come. Thanks for sharing. 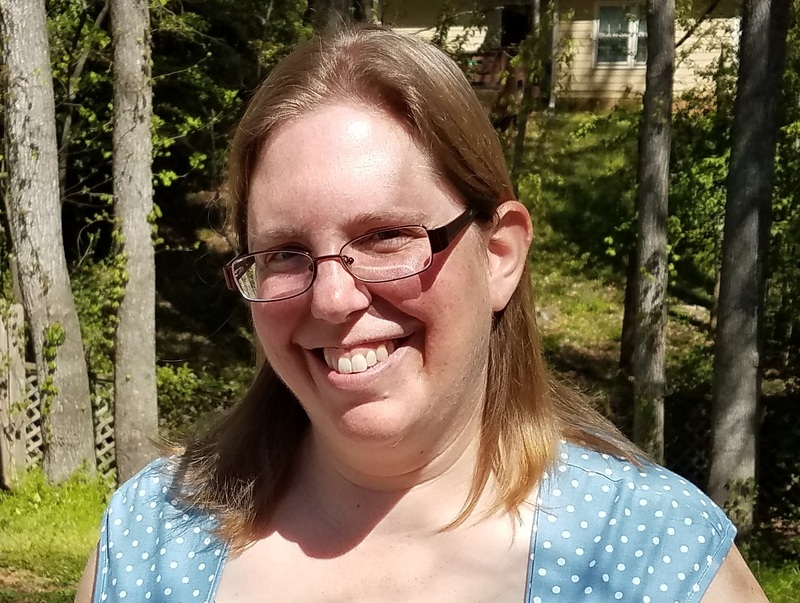 Hey, I am not one any more, but I was a librarian for 10 years. Loved it. We have so much in common! I am not a perfectionist at all although I do try to match seams and not knock off too many points. I love scrap quilts and both of your layouts are wonderful so I am afraid I can't choose. 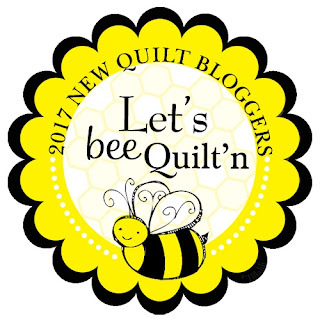 So looking forward to getting to know you better through the New Quilt Bloggers! I like Layout A and I too prefer scraps because I mainly work with thrifted fabric anyway. I am not sure if I will ever be able to quilt at the competition level. I engage in a lot of ASR (angry seam ripping) when things don't go as planned. Hi Emily! Dogwood trees in bloom are so beautiful! I loved seeing streets lined with them in bloom in Tokyo. 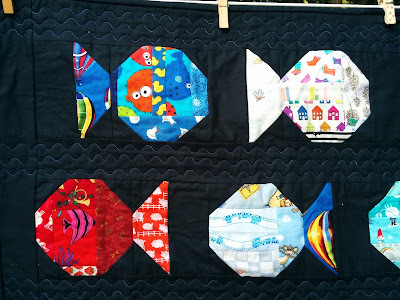 I've never seen a fish I Spy quilt before--cool! I am a scrap quilter, mainly because I'm trying to use up stash. Great to meet you! Firemen are always pretty darn cute, but this little guy takes the cake! Great quilts! I especially love the fishy quilt. 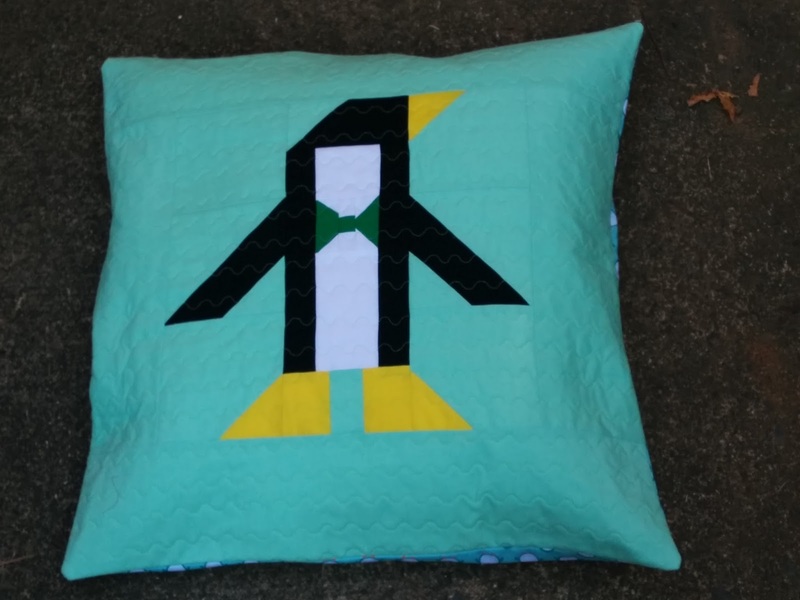 May have to try that for a Project Linus Quilt! I think I like layout A better. 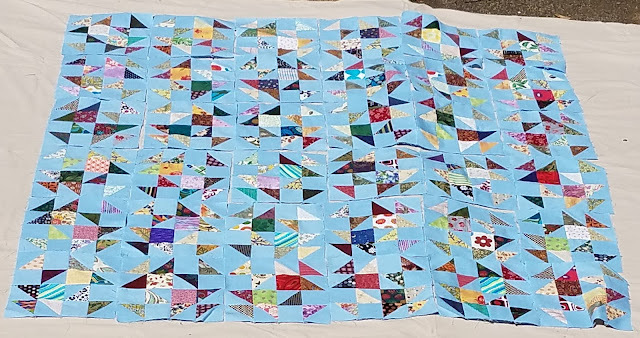 I love a good scrappy quilt but I never seem to have any scraps! Lol. I really liked seeing some of your quits and I'm super impressed that you've made 31 Project Linus quilts! Wow! I love the fish!!! And I prefer A, personally, though both are great.